Click HERE to get your Farms Forever Tickets. 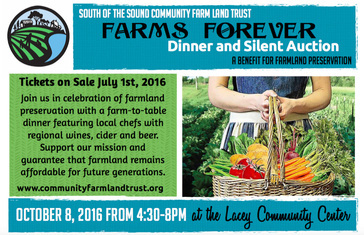 Be a part of this annual South of the Sound Community Farm Land Trust farm-to-table dinner. Enjoy local products direct from our farms with each course carefully prepared by a different featured local chef(s). The dinner tickets include regional wines, cider and beer. Early Bird tickets are just $60 each (non-member rate at $70). Want to bring a group? Sign up for a half table of 5 or a full-table of 10 and save $5 on each ticket. Your participation serves to keep farms in production and affordable to the next generation of farmers so invite your friends to join you. For those of us who are not farmers, we offer the opportunity to host two farmers at your table. Just purchase your own ticket, and then buy 1 more ticket. Due to a generous contribution by the South of the Sound Community Farm Land Trust Board of Directors, the second ticket will be free. We can select two farmers to be with you for the dinner or you can make your own connection with a couple of local farmers. ​Thanks to our 2016 Farms Forever Sponsors! Farmers Markets are springing up ​all over the Sound! Looking for your local farmers market? Look no further - just click here! Help ensure that our farm families keep farming, and that our precious farmland stays farmland - forever. "The land … willl be farmed in perpetuity, by us in this case, as long as we can, and for sure by someone else after that. The community can rest assured that this piece of property . . . will be producing food for the community, forever."